Q: Is the Market open when it is raining? A: All our Markets are open rain, shine, or snow! If the weather is severe, the MSFM may open later or close earlier, which will be posted on the Nourish Markets Instagram and Facebook pages. Q: Are dogs allowed at the MSFM markets? A: Due to health and safety concerns for shoppers, vendors, and pets, pets are prohibited in two sections of the MSFM: the center aisle between vendors on Market Square and along Market Street. Service animals will always be permitted, and animals that are safely confined in carriers will be allowed. Union Avenue, and the sidewalk areas of Market Square, and Krutch Park are dog-friendly zones where patrons will find food trucks, dog treat vendors, and many other MSFM vendors. Q: Do you accept SNAP/EBT? A: Yes, we accept SNAP through a centralized program at our information booth at all our Markets. Please visit the Programs tab for more information. Q: Do your vendors accept credit cards? A: Most vendors accept credit cards, but not all. 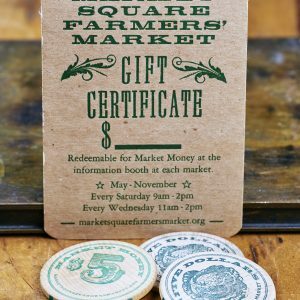 We offer a Market Money program at all our markets, where customers, for a $2 fee, can swipe their credit card at our information booth and receive $5 tokens to spend at any Nourish Knoxville Market. Q: Do you allow busking at the MSFM? A: Yes, we welcome buskers at the MSFM in our 4 designated busking zones. In December, the ice rink on Market Square may be playing music and therefore make busking in that area difficult. No amplification will be allowed. Nourish Knoxville reserves the right to dismiss any busker who is causing a nuisance, obstructing pedestrian/vehicle traffic or entrances to shops and buildings. Buskers with excessively loud performances may also be dismissed. Q: What does “producer-only” mean? A: A producer-only market is one at which all items are made or grown by the vendor. Nourish Knoxville may permit vendors to share a booth, where two independently accepted producers sell their products under one tent, and where only one of the producers is on site at a time. Each product must be clearly marketed as produced by the proper vendor. All Nourish Knoxville markets are producer-only.